The best walking course in the Shirakami area! With a trail that allows wheelchair access, this is a course that allows anyone to take a trip through a pristine beech forest just like the World Heritage Shirakami Forest! Within just a short five-minute walk from the car you will encounter the majestic Lord of the Shirakami Forest, a 400-year-old beech. 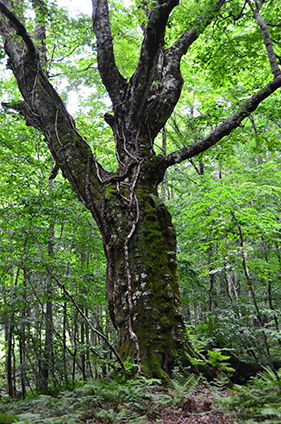 The large beech tree has become a symbol of Shirakami-Sanchi. The tree is 400 years old – its gnarled, bumpy bark conveys their age. Fern, moss, and cranes have all lived here. We strongly recommend you come and visit this dignified guardian of the forest. Carpeted in flowers through spring and summer, this is one of only a handful of precious high moor in Shirakami-Sanchi. In May, Asian skunk cabbage and marsh-marigold can be seen together with the residual snow. And then one ofter another between June and August, Daylily, Kinkoka and Tachigiboshi bloom in profusion. In autumn, the marshland offers great open views and makes a wonderful place to take in the yellow hues of the beech forest leaves covering the surrounding mountainsides. 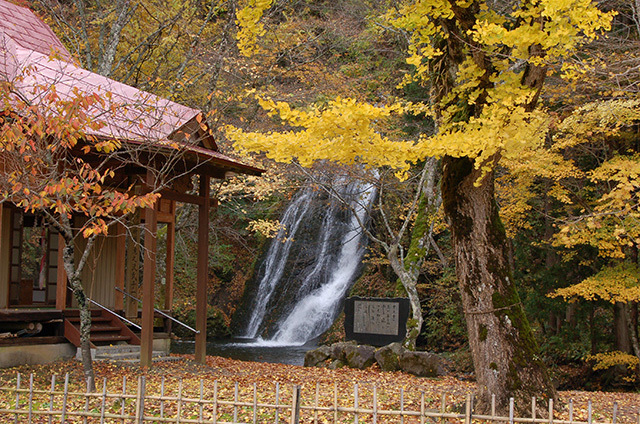 This is the place that offers the magnificent view of Shirakami-Sanchi autumnal leaves! Enjoy the profusions of contrasts in the giant wall of color between the reds of the broad-leaved trees, the yellows of the beeches, and the deep greens of the conifers. The best time to view the autumnal leaves is mid- to late October. 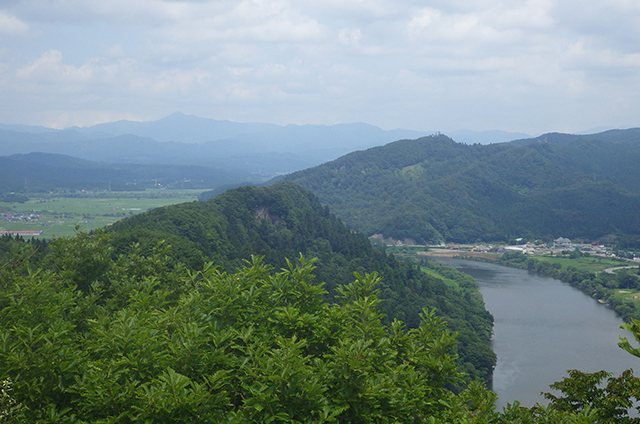 Sanjugama is a beautiful gorge along Masegawa River originated from Shirakami-Sanchi. The gorge is a perfect hiking trail with the pristine water rushing through uniquely shaped rocks and potholes (rock caves created over a long time by mountain stream) The trail is tended all the way from nearby Bunakko Land and is teeming with visitors when the leaves change color in autumn. This is the shortest and most popular route up Mt. 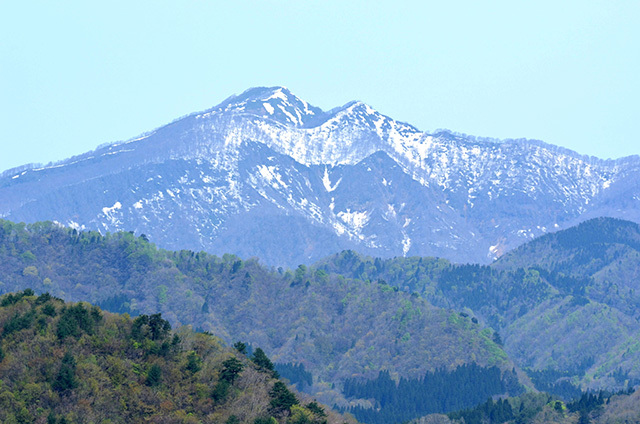 Fujisato-Komagatake (elevation: 1157 meters), one of the famous peaks of Shirakami-Sanchi. 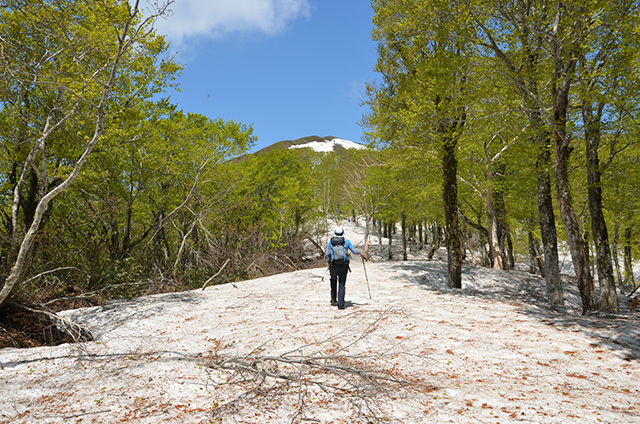 Hikers get to walk through the floral Tanashiro Marshland and through the primeval beech forest on the way to the peak. 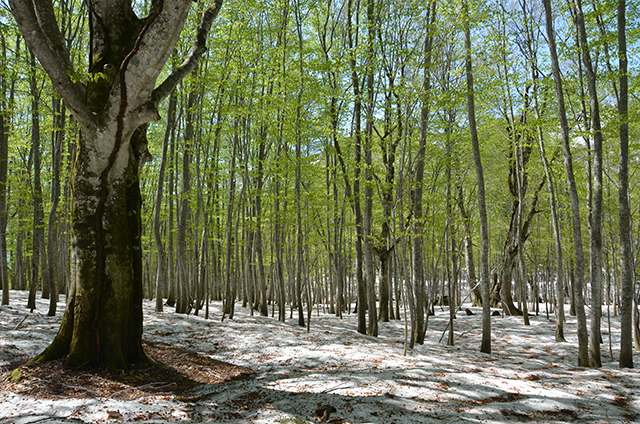 This route through the primeval beech forest is one to be enjoyed by people who really know this forest. The part where the forest flattens out is a sight to behold. 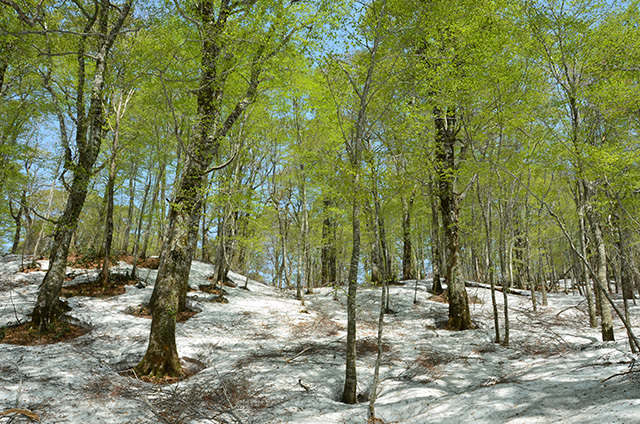 And if that’s not enough, the walk along the last ridge from Maedake peak towards the Komagatake peak – with beech trees as far as the eye can see – is enough to bring a smile to the face of any mountain hiker. This route is full of great places to take in wondrous views of Shirakami-Sanchi. Look west from the summit ridge right into the thick of the primeval beech forest to take in one of the most highly recommended views of Shirakami-Sanchi World Heritage Area. The whole trail from start to finish takes you right through the beech forest. Bearing witness to the severity of Mother Nature, just below the summit – around 1000 meters elevation – is a belt of Siberian Dwarf Pines that can only grow wild at high mountains. This is another great Shirakami-Sanchi view! 1086 meters elevation. 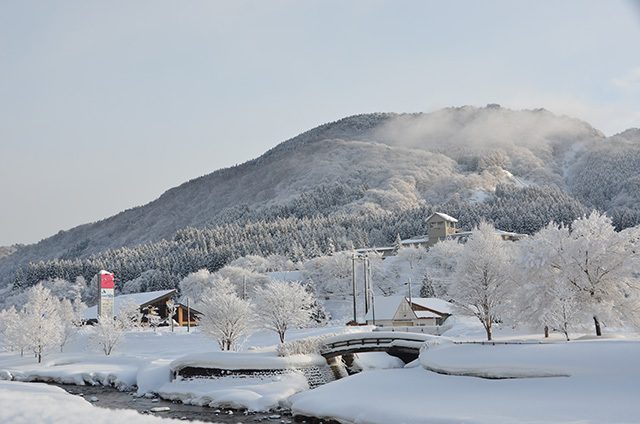 Starting in the town of Happo by the Sea of Japan, the trail begins at the end of Seishu Rindo, which was planned to be constructed to link Nishimeya Village, Aomori Prefecture and Happo Town, Akita Prefecture. Its popularity stems from the fact that it lends good views of Shirakami-Sanchi, is a relatively light hike and because you can get into the World Heritage Area within five minutes of the start of the trail. Nanakura Mountains is a great place for a light trek. It offers its visitors a sense of history and the grandeur of a giant forest, and it is a mountain that is very much a part of the lives of the people who live around it. 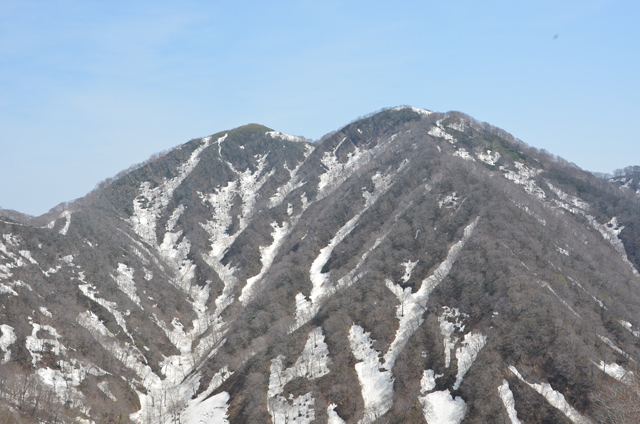 Nanakura Mountains’ name refers to the seven peaks -Nana means “seven” – of Gongenkura, Eboshikura, Minokura, Sanbonsugikura, Shibakura, Okura and Matsukura from which ridges rise towards the main peak while making Yoneshiro River narrow and meander. 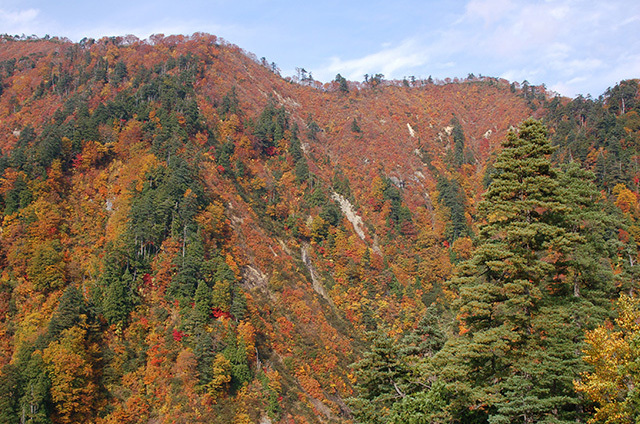 On the eastern slope spreads a magnificent mixed forest of natural Akita cedars as well as deciduous broad-leaved trees. Peering down from the observation deck, you can take in the townscape of Futatsui and Yoneshiro River, while if you look north, you’ll see the mountain scape of Shirakami-Sanchi. Mt. Takayama (elevation: 388 meters) offers great and accessible views of the Shirakami-Sanchi mountain range. 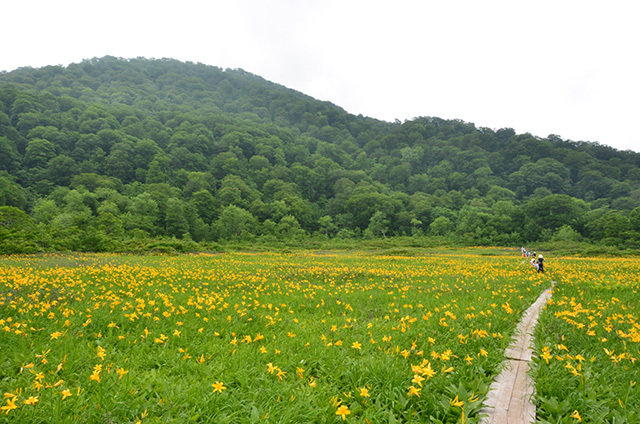 The hiking trail is in a walking distance from the center, even though it is a small mountain, it offers the visitor great nature trail with plenty to see and do, including rich forest and lots of wild animals such as Japanese serow. It is also recommended for light climbing during the snow season when the deeper mountains are inaccessible. You can put on a pair of snowshoes and you may spot some of the footprints and tracks of animals. 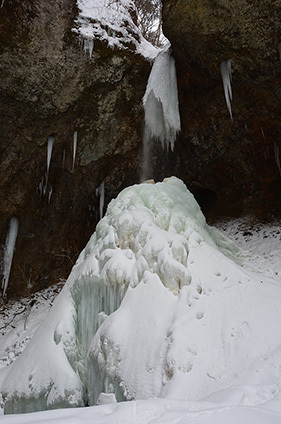 Garo-otaki Big Waterfall, just beside Prefectural Road 317, spills out of the vegetation-rich V-shaped gorge. It is a sightseeing spot that can be enjoyed all year round. 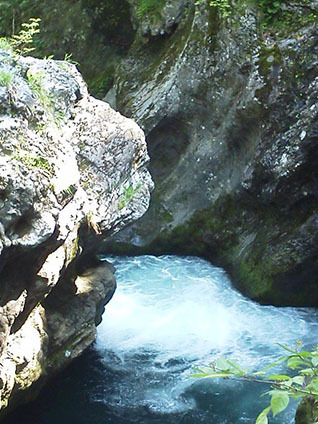 In summer, you can enjoy a dip in the water or “forest terapy”. In winter, you can see the frozen icicles all lit up. In autumnal leaves season, many photography enthusiasts visit here to capture the beautiful autumn colors. There is also a monument of Sugae Masumi, a travel writer in Edo era who wrote a poem about the place. Deep in Yunosawa Onsen Village, “Choshi”, which means a ceramic vessel for serving sake in Japanese gives its name to the waterfall whose power has carved a rounded hollow at the bottom. It is an unusual waterfall in that if you go underneath and look up, surrounded by rocks, you can see the water sliding off the shelf above your head 18 meters up. You can even go in behind the waterfall. *Park your vehicle in the dedicated visitor parking lot. Please do not park at “Yumoto Nagomi no Yu” onsen parking lot.